← James May – Top Gear on Cycling! Most folk had said they were not available for this ride. In addition the weather forecast was bad particularly for after lunch. Steve and I met at Bromley South at 0930 the station was closed and locked. Quite few people tried to gain access whilst we were waiting. If the government wants to prize people from their cars and convince them that public transport is a viable option then public transport has got to run when folk want to travel and I would suggest that Boxing Day is a popular travel day. So come on Southeastern Railways get real. We waited a few extra minutes just in case there were to be a late arrival. There were not and we set off for the Croydon rendezvous. Arriving at East Croydon Station we found Stephanie and Brian buying a coffee and this seemed a jolly good idea so we sat in the coffee bar and waited for any more arrivals. 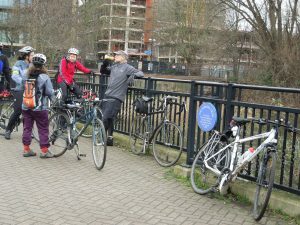 We then had a call from Sue to say she would be waiting for us at the top of the Wandle Trail. 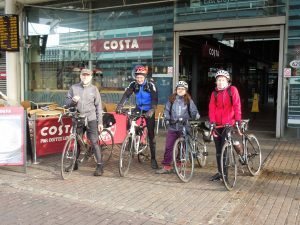 Coffee finished we decided to have a quick photo before we set off and as we posed we were joined by Begonia so now we were five. Steve led us with unerring accuracy through the back streets of Croydon towards and then across Mitcham Common. 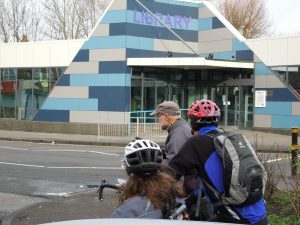 We paused outside Pollards Hill Library to get our bearings and were soon on the road again and then onto the Wandle Trail itself. This was my first ride along the trail so I wasn’t to sure what to expect. The path itself follows the River Wandle on its passage to the Thames. 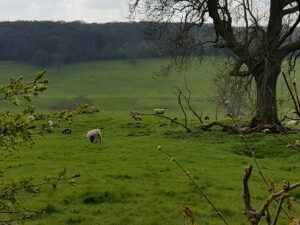 The recent rain had ensured that the river was full and fast flowing. The various dams and weirs we passed were noisy with the roar of fast moving water. The path was wet and quite muddy in places. It was also very popular with dozens of families walking off their Xmas excess. 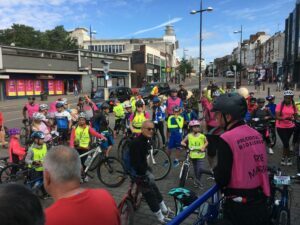 There were numerous children out on very bright shiny looking bicycles – the future of cycling we hope. Progress was necessarily slow on the path. We frequently had to negotiate road crossings etc. at Wandsworth we found the irrepressible Sue awaiting us patiently. We quickly made our way to the mouth of the river. Steve commented that he had never seen the water higher. 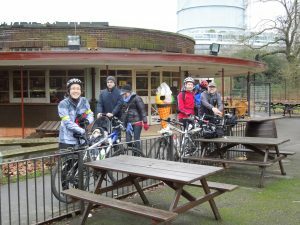 We had already decided that the Richmond Park part of the ride was inadvisable because of the threat of incoming bad weather. Throughout the ride so far the day had got steadily darker, and the clouds more ominous. We decided that we would turn east with the intention that we would individually turn south at whatever point seemed most convenient for our journeys home. At Albert Bridge Begonia was the first to turn off onto the route that she knew would take her safely home; and before the rain arrived too we all hoped. At Battersea Park we found a cafe doing brisk business and pulled over to refuel. Sue shared some of her friends delicious Christmas cake which we all agreed was absolutely splendid. Suitably refreshed we pressed on. Steph and Brian decided they would turn south and go over Clapham Common. Keenly aware of the gathering clouds this seemed a very sensible suggestion so we headed to Brixton with Steph acting as our leader. At Herne Hill we said farewell to Brian and Steph and Sue took up the lead down Half Moon Lane and onwards through Dulwich. At Lordship Lane Sue was home so Steve and I decided to skirt around CrystalPalace and go through Sydenham. Here I said goodbye to Steve and went through Penge and Beckenham. As I pulled into home the rain started. A while later I had a text from Steve confirming he too had beaten the rain home. It was a fantastic day. Really blew out the cobwebs. Well done Steve you were a great leader (as were Steph and Sue for the bits they led.) 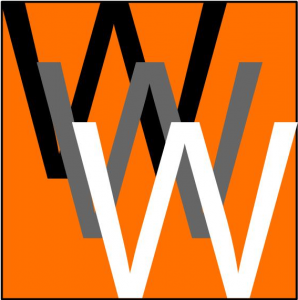 No WWW tonight. See you on New Years Day for the ride to see the New Years Day Parade in Central London.